When Richard M. Nixon ran on the Republican ticket for president in 1960, he was the choice of 61 percent of voters with a college degree, according to Gallup polling. His Democratic opponent, John F. Kennedy, had a narrow edge among voters with only a high-school degree, winning 52 percent of that cohort. By 2016, those trends had flipped. Hillary Clinton won voters with a college degree by a nine-point margin, while Donald Trump won voters without a degree, 52 percent to 44 percent. As affluent and highly educated voters compose a growing portion of the Democratic Party, it stands to reason they would also form a larger segment of its congressional delegation, says Geoffrey Skelley, a political analyst at the University of Virginia Center for Politics. The scales have tipped the furthest with white voters. Wealthy white people “are more likely to go to private institutions than less-affluent whites and nonwhites,” says Mr. Skelley. And that’s what the data show in the House. In the current Congress, 50 percent of Democratic House members hold undergraduate diplomas from private institutions compared with 39 percent of Republicans. This was not the case 25 years ago in the 103rd Congress. Then, 47 percent of Republican lawmakers had undergraduate degrees from private institutions. Just 44 percent of Democrats did. What about some of the most elite private institutions, the members of the Ivy League? As of 25 years ago, Republicans and Democrats were nearly dead even in their share of members with Ivy League bachelor’s degrees, at 6.8 and 7.4 percent, respectively. Now, 12.8 percent of Democratic Caucus members hold degrees from Ivy League institutions compared with 4.2 percent of the House GOP. In Defying the Odds, we discuss the historical roots of Trumpism. They do not believe that America is engaged in a civil war, with the survival of America as we know it at stake. Some on the right have been talking that way for a long time. On August 28, 1988, Newt Gingrich gave a talk at the Heritage Foundation titled "Building the Conservative Movement After Ronald Reagan." [Up] until the Bork nomination, all of us failed to appreciate that the Left in this country has come to understand politics as civil war. The Left at its core understands in a way that Grant understood after Shiloh that this is a civil war, that only one side will prevail, and that the other side will be relegated to history. This war has to be fought with the scale and duration and savagery that is only true of civil wars. While we are lucky in this country that our civil wars are fought at the ballot box, not on the battlefield, nonetheless it is a true civil war. So the deliberate, systematic smearing and destruction of Bork was normal. It was precisely what would happen in a civil war. You can expect from here on that the hard Left, which includes Jim Wright and Tony Coelho and many people who do not look hard Left, will try by chameleon-like actions to destroy our country. In fact, these individuals practice being chameleons: they are who they have to be today in order to be acceptable. But they do not represent American values. The hard Left will systematically root us out and destroy us if they can. Many analysts predicted that minorities would represent a larger share of the electorate in 2016 than in 2012. They did not. Taken together, Hispanics, blacks, and people of other races made up virtually identical shares of the vote in 2016 (26.6 percent) and 2012 (26.2 percent). The long-awaited surge in Hispanic turnout did not occur in 2016. Hispanics were a larger share of voters in 2016 (9.2 percent) than in 2012 (8.4 percent), but their rate of voting was essentially flat, 48 percent in 2012 and 47.6 percent in 2016. In another interesting note on the data, the Pew Research Center reported that the number of eligible Hispanic non-voters was higher than the number of eligible Hispanic voters, as has been the case in presidential elections since 1996. Hispanics’ electoral clout does not yet match their demographic weight. Hispanics tilt toward Democrats, giving about two-thirds of their votes to them in recent years. Since 1996, when 53 percent of blacks reported voting, black turnout rose with every national election, reaching its high point in 2012, when 66.6 percent of blacks voted. That year, the rate of voting by blacks was higher than the rate of voting by whites for the first time in the data series. Many expected that black turnout would continue its steady increase of the past two decades. In 2016, however, black voter turnout declined to 59.6 percent, significantly below its record high and below the white rate (65.3 percent). The group is one of the few monolithic bloc votes in American politics, tilting overwhelmingly toward Democrats. Finally, the white share of the electorate did not decline as it has in most recent presidential contests. As the Census noted, “[F]or the most part, from 1980 to 2012, the share of reported voters who were non-Hispanic white decreased from one election to another.” In 1980, 87.6 percent of voters were white; in 2012; 73.7 percent were. And, in 2016, their share was 73.3 percent. White voter turnout increased from 64.1 to 65.3, again defying the predictions of some. In Defying the Odds, we discuss the Sanders candidacy. At Politico, David Siders reports that the left wing of the Democratic Party is having a hard time following up on Sanders's unexpectedly strong showing in 2016. Trump seems to think NATO is like a social club, with member nations paying dues into some central kitty. It isn’t. A 2014 agreement established that member countries should be spending 2 percent of their GDP on their own military defense. Those countries have until 2024 to hit that goal. Trump is trying to be the world’s policeman on a policy that’s neither set in stone nor even a concern for another seven years. It’s also rich coming from someone whose most noted business practice is a refusal to pay his debts. The speech went over like a lead balloon with assembled world leaders, who smirked, snickered and whispered to each other as Trump spoke. In the video below, Luxembourg’s Xavier Bettel and France’s Macron seem to share a giggle at Trump’s expense. On Sunday, German Chancellor Angela Merkel uttered a single sentence that speaks to how fundamentally President Donald Trump has reshaped -- and will continue to reshape -- the world, and America's place in it. "The times when we could completely rely on others are, to an extent, over," Merkel said at a beer hall(!) rally to support her campaign. While Merkel made no mention of Trump specifically, she made clear that her realization had come "in the last few days" -- a time period which overlapped with a G7 meeting in which Trump blasted America's traditional European allies over NATO obligations and made clear that he was more than willing to go it alone on climate change and trade. Germany's foreign minister launched a scathing criticism of Donald Trump on Monday, claiming the US President's actions have "weakened" the West and accusing the US government of standing "against the interests of the European Union." Just 24 hours after German Chancellor Angela Merkel declared that Europe could no longer completely rely on traditional allies such as the US and Britain, the country's top diplomat, Sigmar Gabriel, went a step further. "The short-sighted policies of the American government stand against the interests of the European Union. The West has become smaller, at least it has become weaker." Germany should reconsider sharing intelligence with the United States, because Donald Trump and his administration "chatter too much" and could give critical information to Russia, a German MP has warned. Thomas Opperman, the leader of the Social Democrats (SDP), described Mr Trump's handling of classified information a "security risk for the West". It comes after Angela Merkel suggested Germany and Europe can no longer rely on the US under Mr Trump. "My handshake with him, it's not innocent," Macron told the Journal du Dimanche in an interview published Sunday. "It's not the alpha and the omega of politics, but a moment of truth." In the interview, Macron compared his own handshake to his leadership posture. "One must show that we won't make little concessions, even symbolic ones," Macron said. The centrist European leader also likened Trump's diplomatic approach to those of Turkish President Recep Tayyip Erdogan and Russian President Vladimir Putin. "Donald Trump, the President of Turkey or the President of Russia are of a mindset of power relations, which doesn't bother me," Macron said. "I don't believe in diplomacy of the public invective but in bilateral dialogues. I don't let anything go. That's how one makes oneself respected." It is a tactic that others have also employed when meeting the US leader. When Canadian Prime Minister Justin Trudeau visited the White House, he came prepared, managing to counterbalance Trump's grip with a combination of poise and control. At Politico, Josh Gerstein reports that the Trump scandals -- along with his attacks on Comey and others -- have made it hard for the administration to fill legal jobs. From the outset, the Trump administration was facing a limited pool of candidates for senior positions. Many GOP lawyers and former officials signed “Never Trump” pledges during the campaign and never seriously considered accepting a Trump appointment. Others did, but found themselves essentially blacklisted because of blog posts or other statements made about Trump during the campaign. Trump still has to fill senior Department of Justice roles and the 93 U.S. attorney posts around the country—a task complicated by his decision, in March, to demand the immediate resignation of all remaining Obama-era appointees without a bench of replacements ready to go. Scores of seats on the federal bench also remain open. Pro-defense lawmakers have grown frustrated at how slowly the White House is moving to fill dozens of top-tier posts at the Pentagon, warning that vacancies are hamstringing efforts to advance the president’s national security agenda. The administration has advanced 13 of U.S. President Donald Trump’s picks for the Pentagon’s civilian leadership to the Senate, which has 53 key jobs requiring Senate confirmation. The Senate has confirmed five — Defense Secretary Jim Mattis, Air Force Secretary Heather Wilson had been confirmed by the Senate and three mid-tier nominees — had been confirmed by the Senate as of May 25. Nearly 700 positions are vacant at the Centers for Disease Control and Prevention because of a continuing freeze on hiring that officials and researchers say affects programs supporting local and state public health emergency readiness, infectious disease control and chronic disease prevention. “It’s all the operational details,” said the official, who spoke on the condition of anonymity because CDC staff are not permitted to comment publicly without approval from HHS. The situation has been made worse, the official said, because the agency has been operating without a permanent director since Tom Frieden stepped down in January. That job is considered one of the most crucial public health positions in the government given the CDC's role in tracking and stopping infectious disease outbreaks in the United States and worldwide. 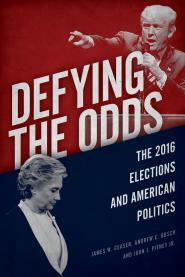 In Defying the Odds, we discuss Trump's role in American political history. Remarkably, we have reached a point where there are serious questions about the loyalty of people close to the White House. Former acting CIA director John McLaughlan on Friday responded to reports that President Trump's son-in-law and senior adviser Jared Kushner discussed setting up a secret communications line between Trump's transition team and the Kremlin, saying if such reports are true, it would be considered espionage. The Russian banker Trump son-in-law Jared Kushner met with in December is viewed by U.S. intelligence as a "Putin crony" and a graduate of a "finishing school" for spies who was often tasked with sensitive financial operations by Putin, according to multiple U.S. officials and documents viewed by NBC News. Sergey Gorkov, 48, graduated from the FSB Academy, which was chartered in 1994 to educate Russian Intelligence personnel. He has long served Russian President Vladimir Putin in critical economic roles. Most recently, Putin chose him to head of the state-owned VneshEconomBank (VEB). As the Russian state national development bank, VEB has played a critical role in blunting the impact of U.S. sanctions against Russia by finding other sources of foreign capital. Before that, Gorkov was the deputy chairman of Sberbank, Russia's biggest bank, also state-owned, and also under U.S. sanctions since 2014. At CNN, Lauren Fox reports that the body-slam guy won the Montana special. ... Montana's election may be an unreliable arbiter of what's to come in races across the country. After all, the race here featured a banjo-playing, first-time Democratic candidate, and many of Montana's voters cast absentee ballots before the alleged assault even took place. The events that transpired here won't be easily replicated. A most useful spreadsheet on special elections. You can trace back the decline in our politics to a single campaign and a single candidate, who riled up his crowds to turn on the press and hurl abuse in their direction. That’s the same candidate who longed for the days when he could punch protesters in the face. Sure enough, his supporters ended up punching people in the face. Fortunately the rule of law still endures in the courts, where a Kentucky judge recently denied the candidate’s claims that he was just exercising his rights to free speech and couldn’t be sued for inciting violence. This is not a small development in the long history of shocking Trumpisms. You don’t need to take the Guardian’s word for it. Here’s the opinion of William McRaven, the former special ops commander and architect of the raid that killed Osama bin Laden: “This sentiment may be the greatest threat to democracy in my lifetime,” he told journalism students at the University of Texas earlier this year. Israel says it has changed its intelligence-sharing protocols with the United States after President Donald Trump disclosed classified information to Russian diplomats earlier this month that had come from Israel, even though Tel Aviv had not assented to his handing it to another country. Israeli defense chief Avigdor Liberman told Army Radio on Wednesday, “I can confirm that we did a spot repair and that there’s unprecedented intelligence cooperation with the United States." It’s rare for a single quote to tell you something genuinely new and important about a story as big as the Trump-Russia scandal. There are exceptions — and former CIA Director John Brennan just gave us one for the ages. Testifying in front of the House Intelligence Committee Tuesday, Brennan said that Russia “brazenly interfered” in the 2016 elections and had been in active contact with members of the Trump campaign. Brennan was careful to avoid explicitly saying that the two sides colluded, and said the Trump aides may not have even known the Russians were spies. Then he dropped the hammer. "Frequently, people who go along a treasonous path do not know they are on a treasonous path until it is too late,” he said. Donald Trump has already changed the Democratic Party more than his own Republican Party. While the president has merely reduced his own party into a panicked mess, the Democrats’ trajectory seems to have moved subtly and decisively away from the center-left Clinton liberalism toward a politics whose planks make Barack Obama look like Al Gore. I know, it’s been a distracting month. So you’re forgiven if you missed the big development on the Democratic Party policy front: the call for “a large-scale, permanent program of public employment and infrastructure investment.” That plan, titled “A Marshall Plan for America,” came not from Bernie Sanders but from the Center for American Progress, the Clintonite Washington think tank John Podesta led. The proposal breaks in tone and substance with the Clinton–Obama focus on an economy led and dominated by the private sector. In Defying the Odds, we discuss problems facing the Democratic Party. The just-concluded state convention in California is a good example. One would be wrong because of a dependable political axiom – by eliminating competition with the rival party, hegemony breeds internal conflict. That axiom was on display Saturday at a state Democratic convention in Sacramento as the party’s very liberal professional leadership was buffeted by insurgents with even more leftish agendas, such as universal health insurance, free college educations, a ban on fracking, and more aggressive action on climate change. RoseAnn DeMoro, executive director of the California Nurses Association, told hundreds of nurses and health care advocates gathered for a rally at the Capitol. Burton regained his typically cantankerous posture when he closed his farewell by addressing President Trump — bluntly, directly and defiantly. He raised both middle fingers toward the crowd. For a moment, protests were forgotten, and the audience roared.